This year is all about holographic makeup. And I am so, so happy. Not only is the holographic makeup finally good, it is phenomenal. The colors are so rich and vivid and the pigments in the lip glosses actually stay on your lips and don't disappear like they used to. I love the new holographic makeup. 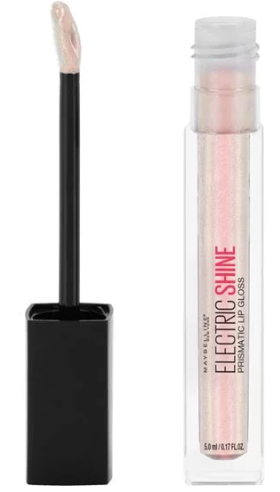 And one of the things I love are these new Maybelline Electric Shine Prismatic Lip Glosses that come in six shades and are completely gorgeous. 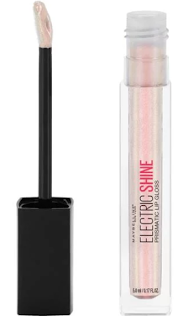 Lip Studio Electric Shine Prismatic Lip Gloss delivers iridescent shine for a multi-dimensional lip look. Definitely outshine the rest with these beautiful holographic liquid lip glosses. This high shine lip gloss is available in a range of shiny shades from blue to purple to white to silver. The colors are: Magentic Ice, Cosmic Light, Electric Blue, Lunar Gem, Midnight Prism and Moonlit Metal. I tried three of the shades: Magnetic Ice, Moonlit Metal and Cosmic Light.